Here’s an eye opener: Rackspace, which put itself on the market a few months back, is officially taking itself off and named current president Taylor Rhodes as CEO. The company dropped the news Tuesday afternoon in a press release that said the company’s board and independent advisors had run through a series of scenarios including acquisition or share buybacks before ruling them out. In this process we talked to a diverse group of interested parties and entertained different proposals. None of these proposals were deemed to have as much value as the expected value of our standalone plan. We concluded that the company is best positioned to drive value for shareholders, customers and Rackers through the continued execution of its strategic plan to capitalize on the growing market opportunity for managed cloud services. Rhodes, a sales exec with the San Antonio-based company, was named president in January. Lew Moorman, who had held that post, stepped down in July 2013. Now Rhodes replaces Weston, who became interim CEO when Lanham Napier left in February. Three months later, it hired Morgan Stanley to help evaluate its options, which included mergers or acquisitions. [company]Rackspace[/company] has been at the center of speculation for more than a year. It’s in the public and private cloud space parlaying OpenStack, the open-source cloud framework it helped birth, but it’s facing super-heated competition from giants like Amazon Web Services and Microsoft Azure on the public front and an array of umpteen OpenStack clouds in the private arena. The market was not impressed, the feeling perhaps being that there were no takers. 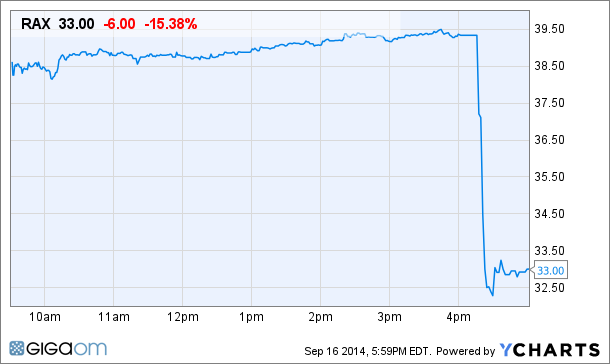 Rackspace was off more than 15 percent down $6.00 from its $39.50 close in after hours trading. Note: this report was updated at 8:12 p.m. PST with more detail from Rackspace’s statement. I think they succeed by biding time as a great web host until the next wave happens. Open stack won’t succeed against Amazon except as a niche offering. But who knows what’s next? I float between surprised and not. With a market cap of over $5B only a hand full of players made sense. I kid of feel that toothpaste is out of the tube. When they positioned themselves as an OpenStack Public Cloud company there was a growth expectation built into the stock. That growth didn’t take place and I think they want to go back to their roots as a managed hosting company which isn’t as exciting from a growth perspective. It’s at least not as exciting from a story perspective. I don’t see them failing but I struggle to see what they succeed at.